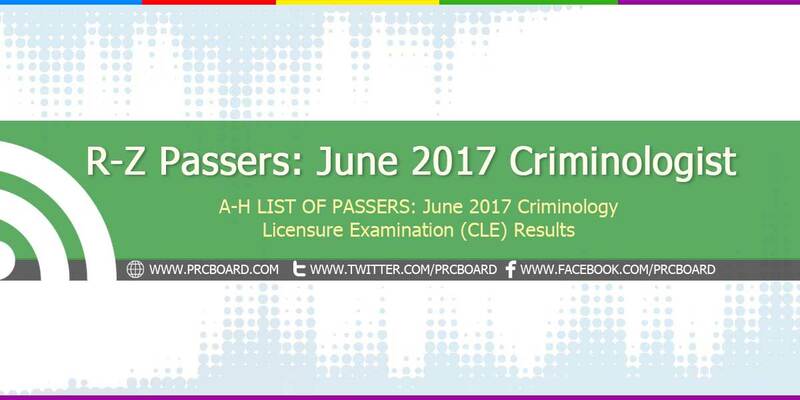 MANILA, Philippines - The official results, list of passers, top examinees, performance of schools and other important announcements for June 2017 Criminologist Licensure Exam (CLE) are released by the Professional Regulation Commission (PRC) Board of Criminology 12 working days after the last day of board examination. Below is the list of passers for June 2017 CLE with surnames starting with letter R to Z. NOTHING FOLLOWS---------------------- Criminology Licensure Examination is one of the most-numbered examinees being administered by PRC. CLE exams are scheduled twice a year to cater the growing number of aspiring law enforcers. For 2017, CLE exams are scheduled on June 2017 and December 2017.